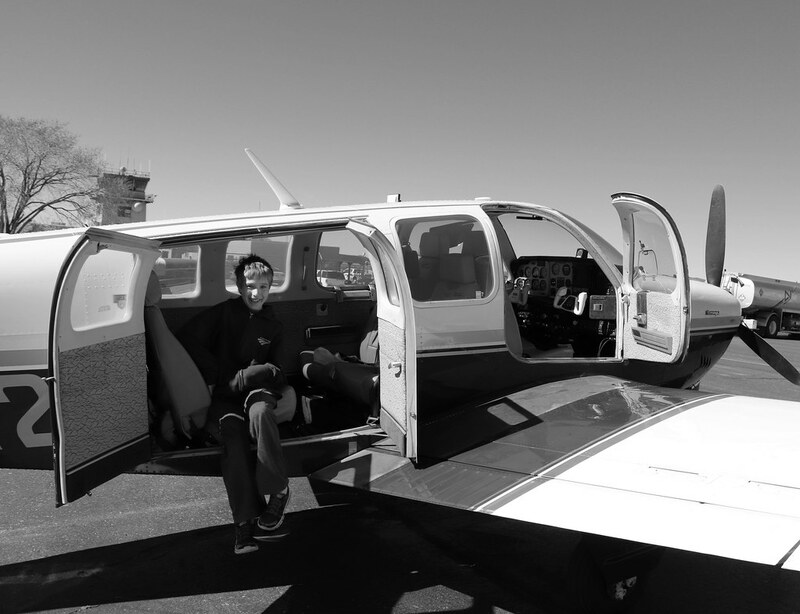 To be a pilot of a small plane is to be a scientist, a mathematician, and a poet. We read charts, analyze weather reports and forecasts, calculating what the headwinds will do to our fuel situation. But in the end, the wise ones let the earth speak to us through these charts, and go where it invites us — where the skies are smooth and blue. 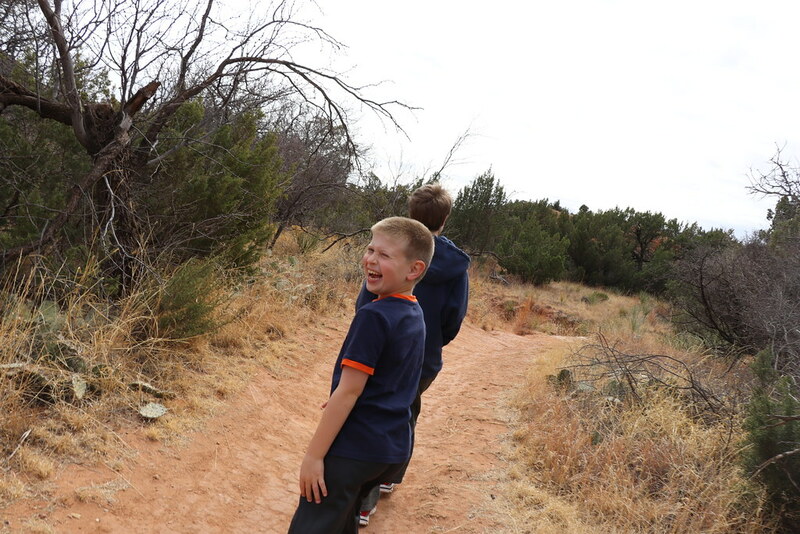 And so it was last week that we did not go to California as planned, but instead to the mountains near Santa Fe, a canyon near Amarillo, and a remote museum in far southwest Kansas — all the while hearing the delighted exclamations of “wow!” from our children. 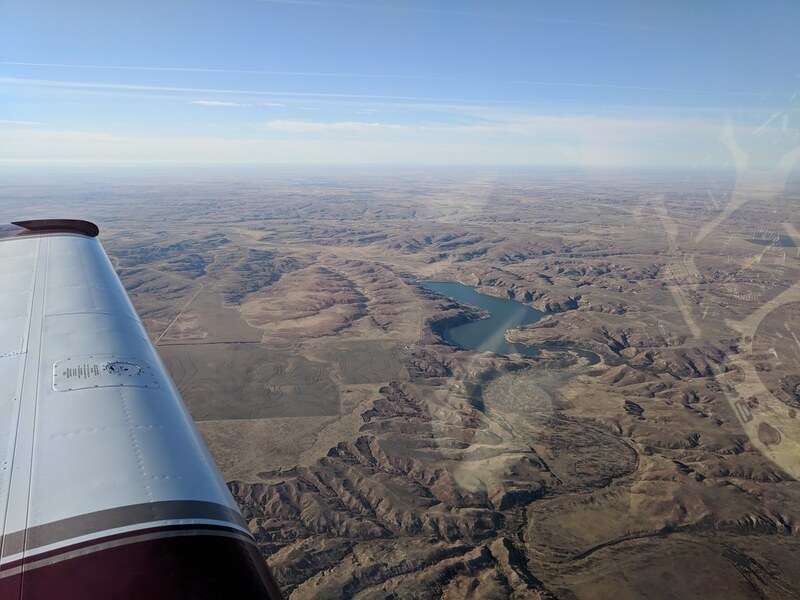 As we sailed along up there in our flying machine, down below we saw the rugged, craggy mesas of New Mexico, here and there punctuated by a lake, a little town, or an isolated airport — each a friendly sight in its own way. Our boys read some books, and sometimes pressed their noses to the windows, while little Martha mostly slept and sometimes played or ate — she enjoys flying more than driving. 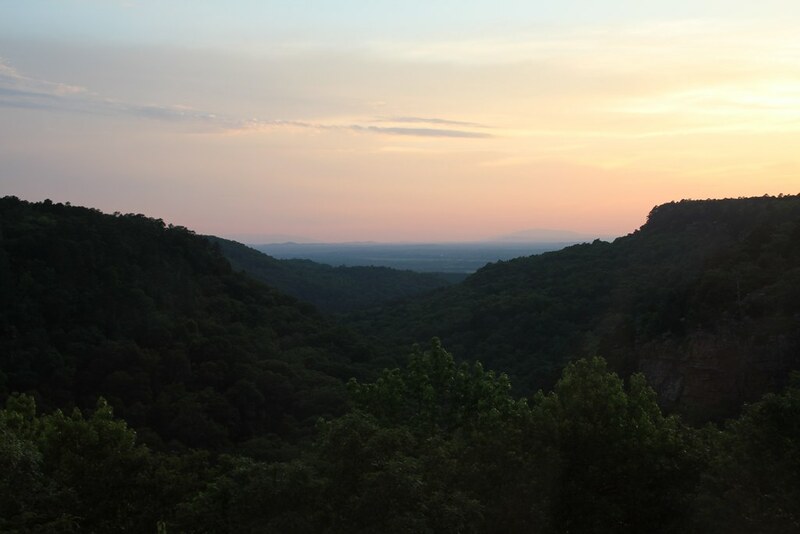 Mountains have a way of reminding us all that the earth is larger than we are. We drive around them, fly around them, and even on a pleasant day they make the air bumpy. But once down on the ground, Oliver got out of the plane, and looked at the mountains all around us. He couldn’t stop saying “Wow! Dad, wow! Amazing! Look at that!” Jacob was more excited that an American Airlines plane was taxiing by right where we had been a minute before. The boys helped us plan our trip. They’re the ones that chose for us to head southwest, and the #1 thing on their Santa Fe agenda was riding the New Mexico Rail Runner Express. So, despite a strong and cold wind, ride it we did, all the way to Albuquerque for pizza, then back to Santa Fe. When they weren’t busy listening to the “meep meep” sound the doors make when they’re about to close, they were excitedly reading the timetable or taking in the world as it whizzed past their window. 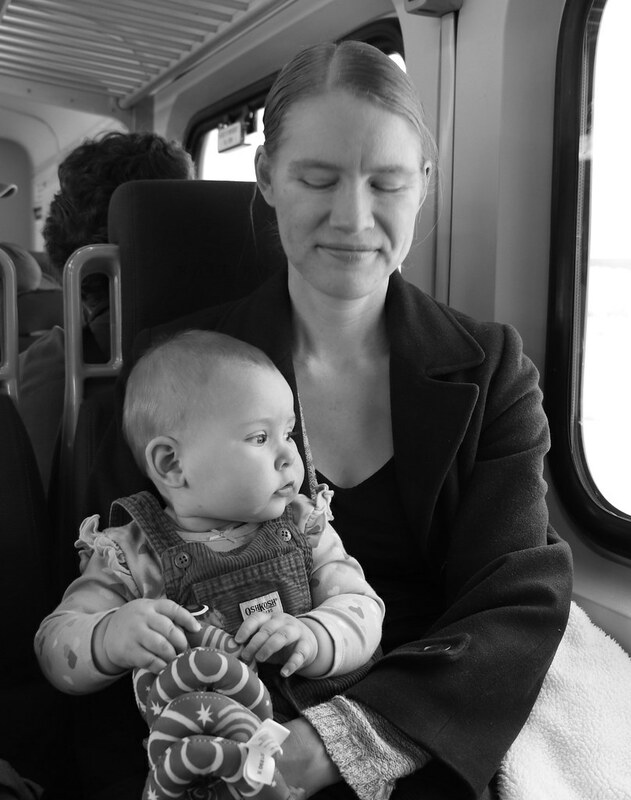 Martha, too, took in the train — though she still enjoyed her chew toys. Those things out the window don’t fit into a mouth so easily. 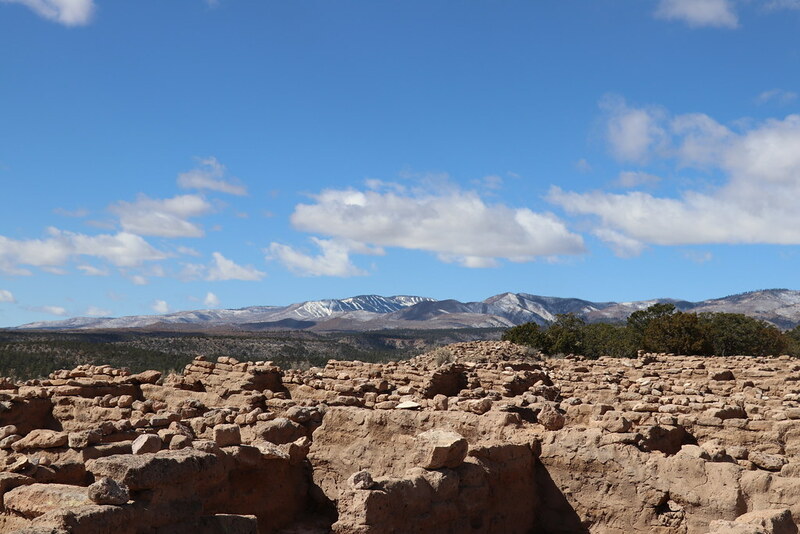 Up in the mountains, the Puye Cliff Dwellings brought home the history of the place. The stories of the peaceful people that lived there, told by their descendants, members of the Santa Clara pueblo. Our guide Elijah picked up a shard of pottery, many of which remain on the mesa. He explained why there were no intact pottery examples up there. When his ancestors were done with a pot, then would throw it on the ground, shattering it — to give it back with thanks to the earth from where it came. One gets the sense that these ancient peoples knew quite a few things that our modern societies have not yet learned. After a full day, a cool evening in our hotel was welcome. 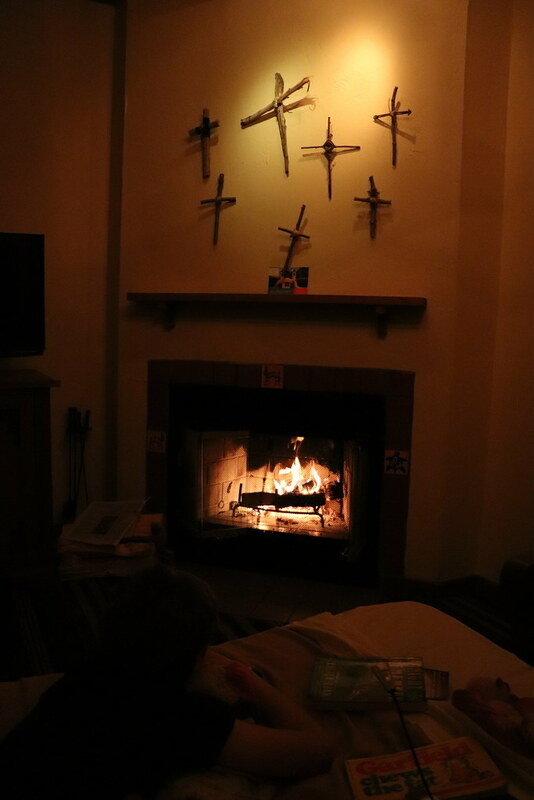 Our room had a wood-burning fireplace, burning the pinyon pine that gives Santa Fe such a distinct sweet smell in the winter. Jacob would gaze into the fireplace for quite awhile. 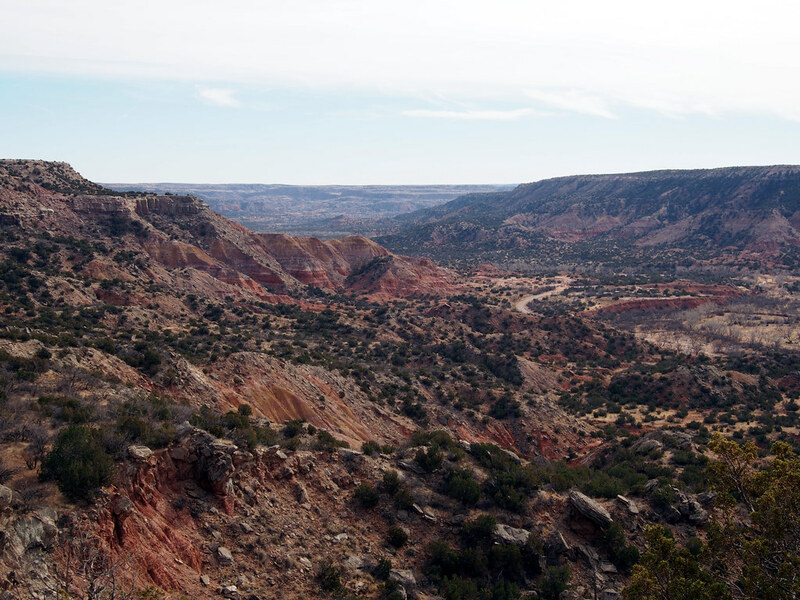 I have never seen a photo do justice to Palo Duro Canyon. As you drive along the desolate, high Texas prairie, complete with tumbleweeds, all of a sudden you go around a corner and the earth opens up. It’s the “painted canyon” for a reason, and even though we’d been there before, as we rounded that bend, I heard exclamations of “Dad, this is AMAZING” from the back seat once again. The vastness of the place cannot be captured on a screen. 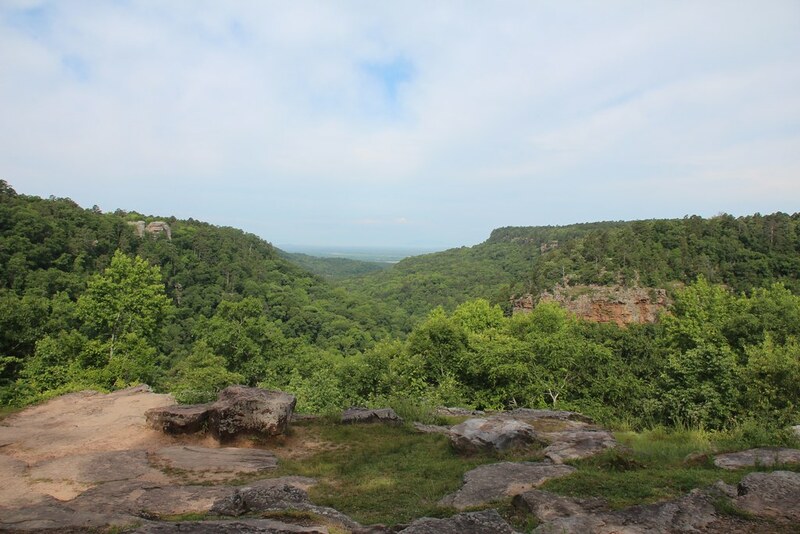 How can one capture 60 miles of color, ridges and gorges stretching out into the horizon, in a few inches? 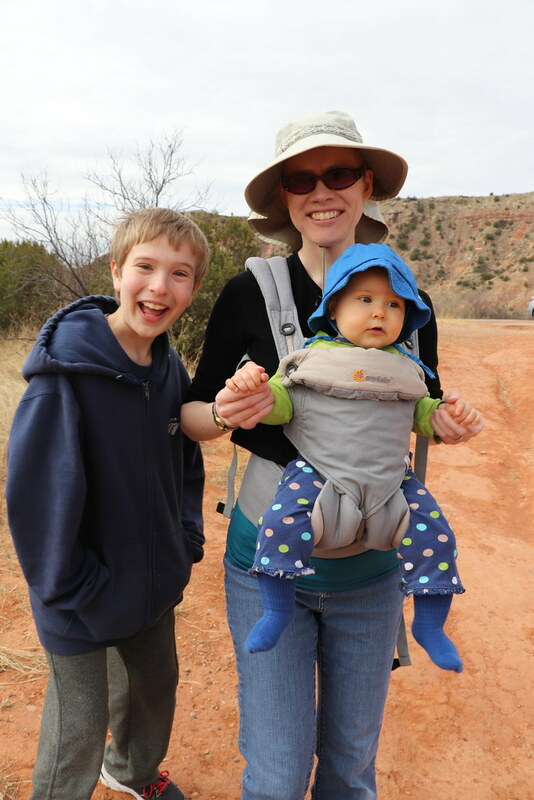 The boys were excited, bubbly, and bouncy as we hiked along some trails on the canyon floor. They’d make up games to play, most of which involved teasing me in some way. Oliver particularly loved to tease me. Jacob insisted I take a picture with him and Martha. But even these excited, bubbly kids would stop to reflect sometimes. Sometimes Jacob would say, “Dad, I have GOT to take a picture of this!” And sometimes they would just stare, maybe even with a mouth agape. Children know beauty, too. All told, we traveled over a thousand miles by air, spending some 7 or 8 hours in the plane. Had we attempted to drive it, it would have been more than 30 hours. There’s something amazing about seeing so much of the world in such a short amount of time. Perhaps this is why many pilots secretly give their plane a little pat after a long journey. After all the smiles, laughter, the memories, the feeling of being part of sky — if you pay attention, it truly is more poetry than physics. And that is why, though it is always nice to return to our home, in my mind’s eye, the hangar door is always open. This has been a spring with times to relax, times to be busy, times of anticipation of a new baby, and times of enjoying our family. Rather than write a lot of words about it, I’m telling the story in photos. To view, click here, then click Show Info in the upper right to see captions. You can pause it with the button in the lower left, and use arrow keys to advance. Alternatively, there’s a captionless slideshow available here. Picture one Sunday morning. 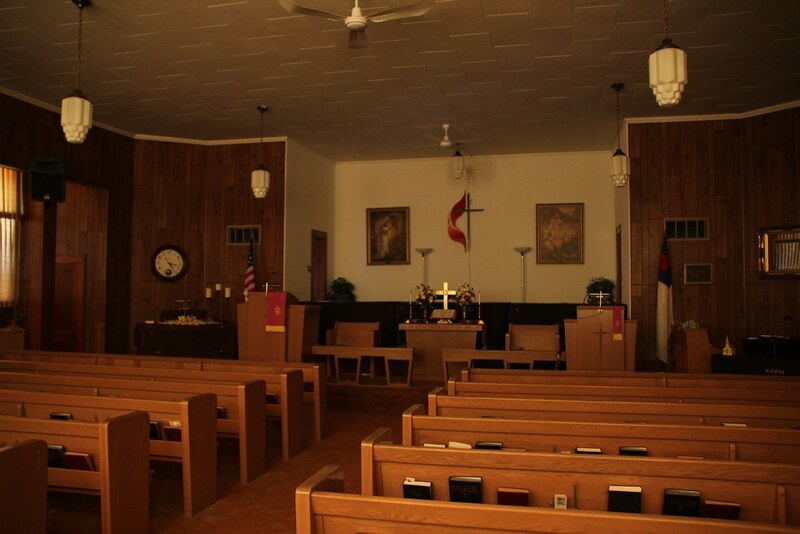 Three guys are seemingly-randomly walking into a Mennonite church in rural Nebraska. One with long hair and well-maintained clothes from the 70s. Another dressed well enough to be preaching. And the third simply dressed to be comfortable, with short hair showing evidence of having worn a headset for a couple of hours that morning. This was the scene as we made a spur-of-the-moment visit to that church — which resulted in quite some surprise all around, since my brother knew a number of people there. Pastor: Peter! What are you doing here? Peter: [jokingly] Is that how you greet visitors here? And then, of course, Peter would say, “Well, we were flying home from South Dakota and figured we’d stop in at Beatrice for fuel. And drop in on you.” Followed by some surprise that we would stop at their little airport (which is quite a nice one). This all happened because it was windy. This is the fun adventure of aviation. Sometimes you plan to go to Texas, but the weather there is terrible, so you discover a 100-year-old landmark in Indiana instead. 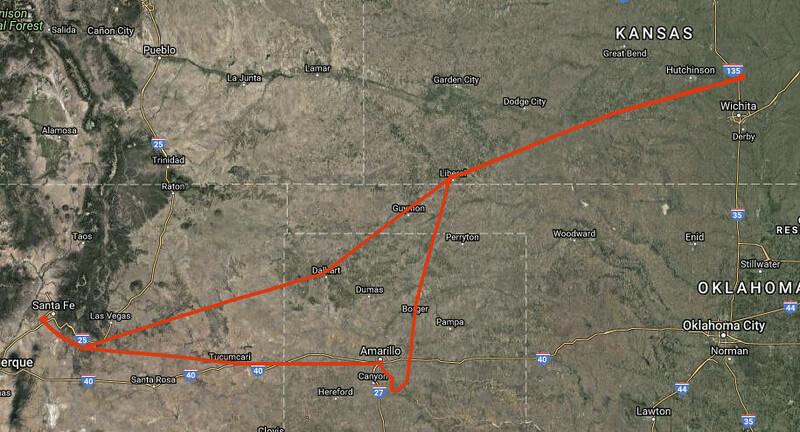 Or sometimes, like a couple of weeks ago, we planned to fly straight home but spent a few hours exploring rural Nebraska. The three of us flew to Sioux Falls, SD, in a little Cessna to visit my uncle and aunt up there. 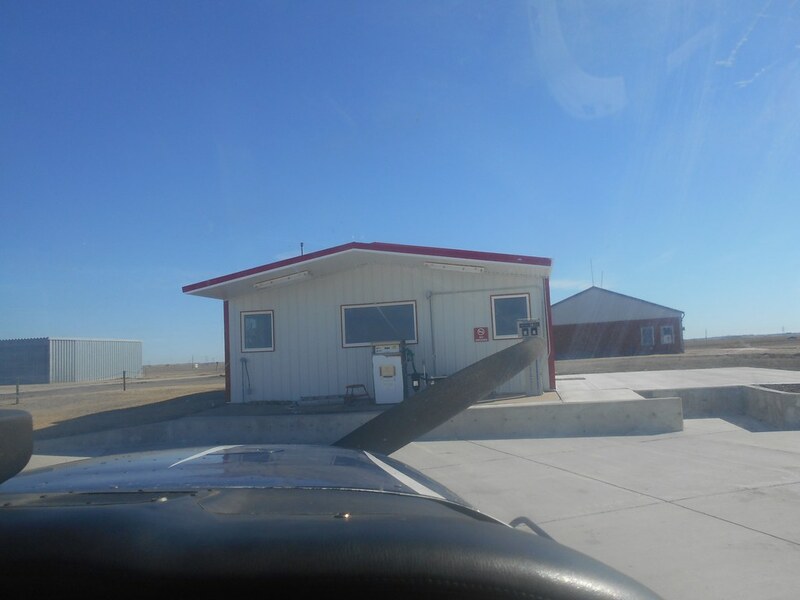 On our flight up, we stopped at the little airport in Seward, NE. It was complete with this unique elevated deck. In my imagination, this is used for people to drink beer while watching the planes land. It was a fun weekend to spend with my brothers — first time we’d been able to do this in a long while. And it marked the 11th state I’ve flown into, and over 17,000 miles of flying. That’s always a good sign. 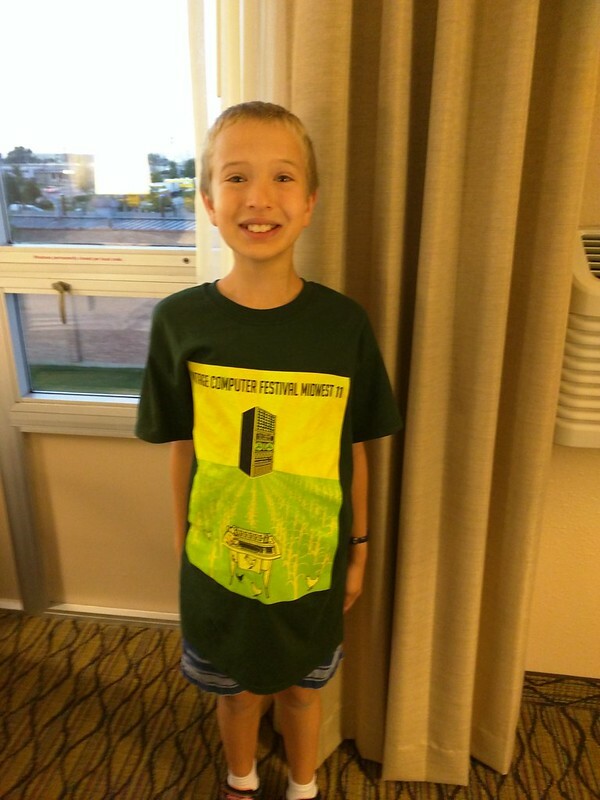 When I first heard about the Vintage Computer Festival Midwest, I almost immediately got the notion that I wanted to go. Besides the TRS-80 CoCo II up in my attic, I also have fond memories of an old IBM PC with CGA monitor, a 25MHz 486, an Alpha also in my attic, and a lot of other computers along the way. I didn’t really think my boys would be interested. But I mentioned it to them, and they just lit up. They remembered the Youtube videos I’d shown them of old line printers and punch card readers, and thought it would be great fun. 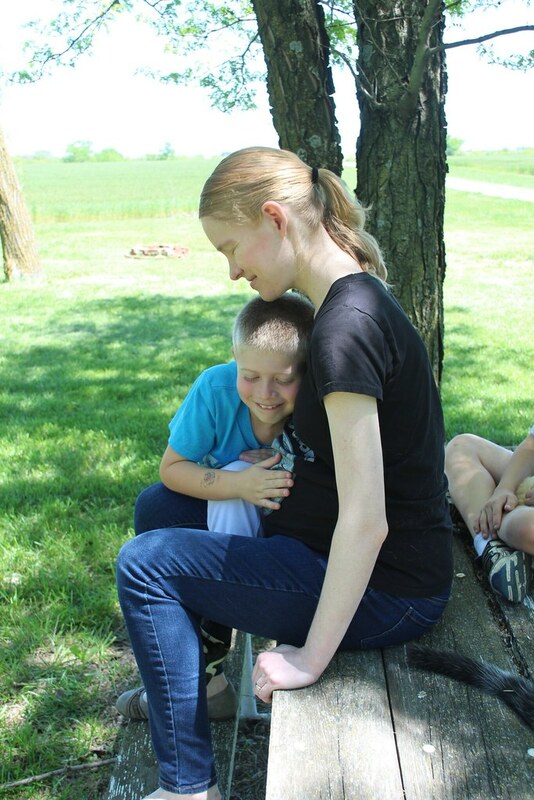 I thought it could be a great educational experience for them too — and it was. It also turned into a trip that combined being a proud dad with so many of my other interests. Quite a fun time. Chicago being not all that close to Kansas, I planned to fly us there. 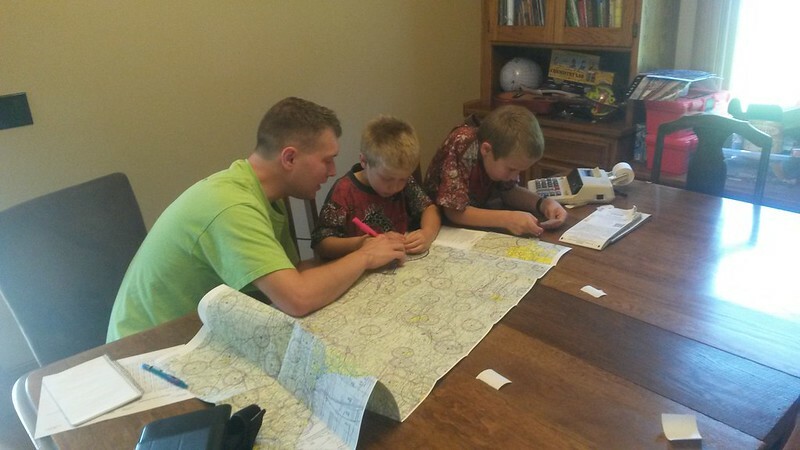 If you’re flying yourself, solid flight planning is always important. I had already planned out my flight using electronic tools, but I always carry paper maps with me in the cockpit for backup. I got them out and the boys and I planned out the flight the old-fashioned way. Here’s Oliver using a scale ruler (with markings for miles corresponding to the scale of the map) and Jacob doing calculating for us. 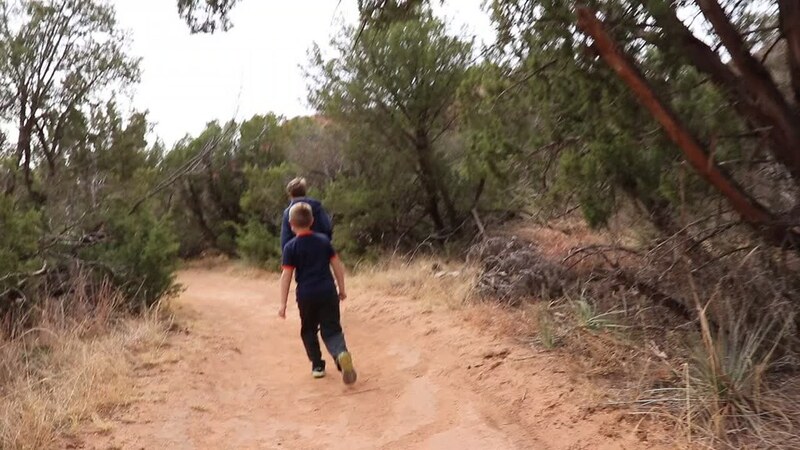 We measured the entire route and came to within one mile of the computer’s calculation for each segment — those boys are precise! We figured out how much fuel we’d use, where we’d make fuel stops, etc. The day of our flight, we made it as far as Davenport, Iowa when a chance of bad weather en route to Chicago convinced me to land there and drive the rest of the way. The boys saw that as part of the exciting adventure! Every little airport we stopped at featured adults smiling at the boys. People enjoyed watching a dad and his kids flying somewhere together. Oliver kept busy too. He loves to help me on my pre-flight inspections. He will report every little thing to me – a scratch, a fleck of paint missing on a wheel cover, etc. He takes it seriously. Both boys love to help get the plane ready or put it away. His other favorite thing was the phones. 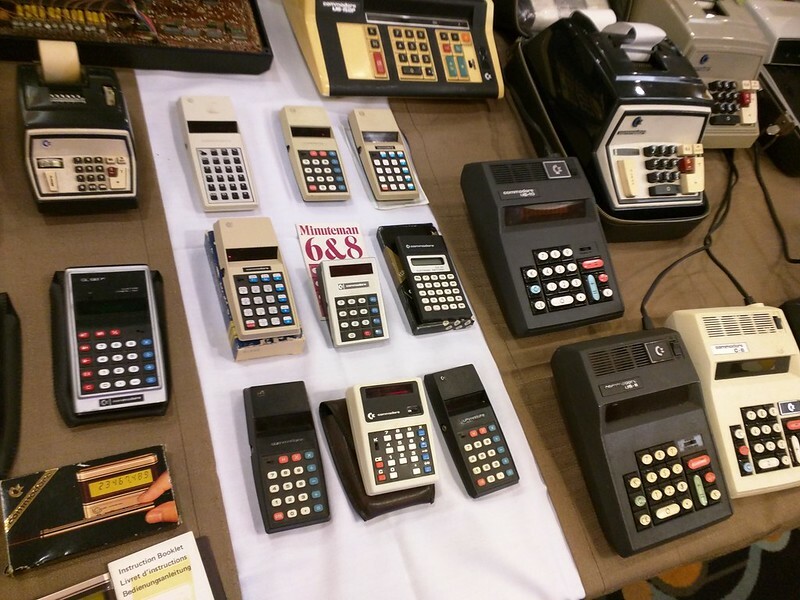 Several people had brought complete analog PBXs with them. 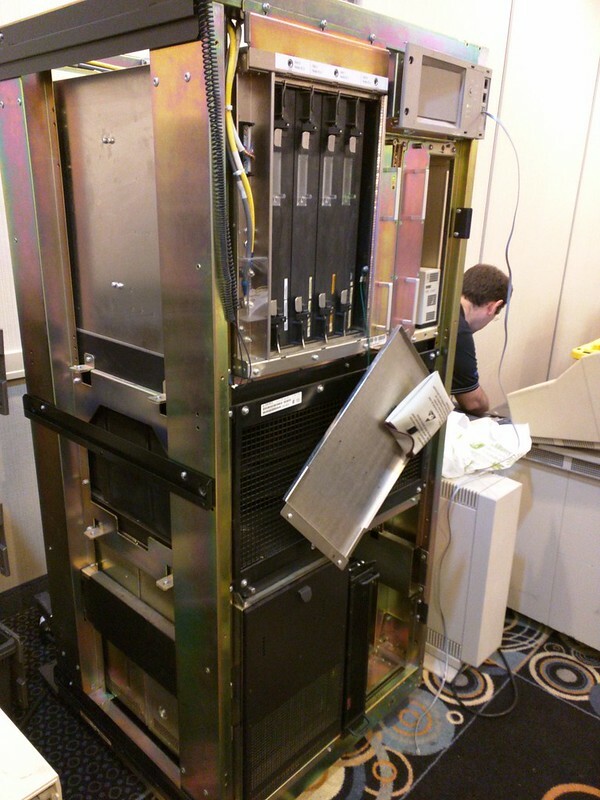 They used them to demonstrate various old phone-related hardware; one had several BBSs running with actual modems, another had old answering machines and home-security devices. 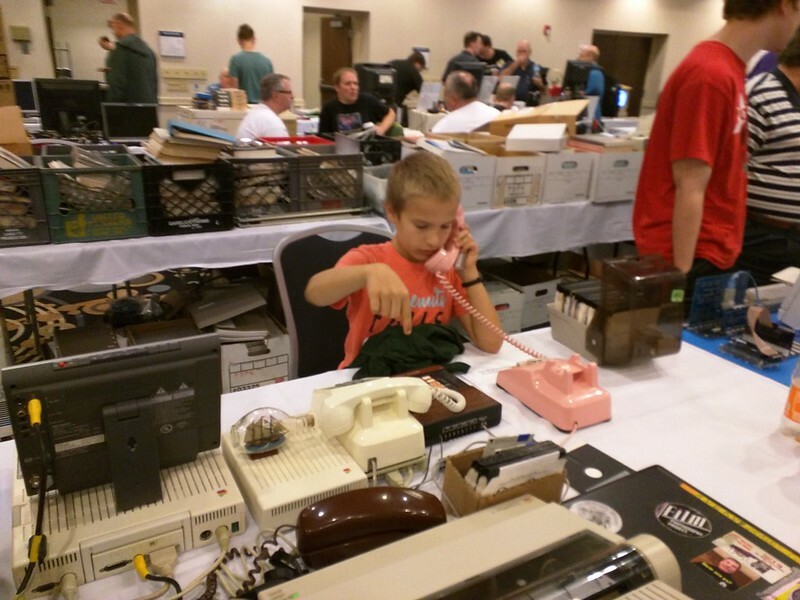 Jacob learned a lot about phones, including how to operate a rotary-dial phone, which he’d never used before! Oliver was drawn more to the old computers. 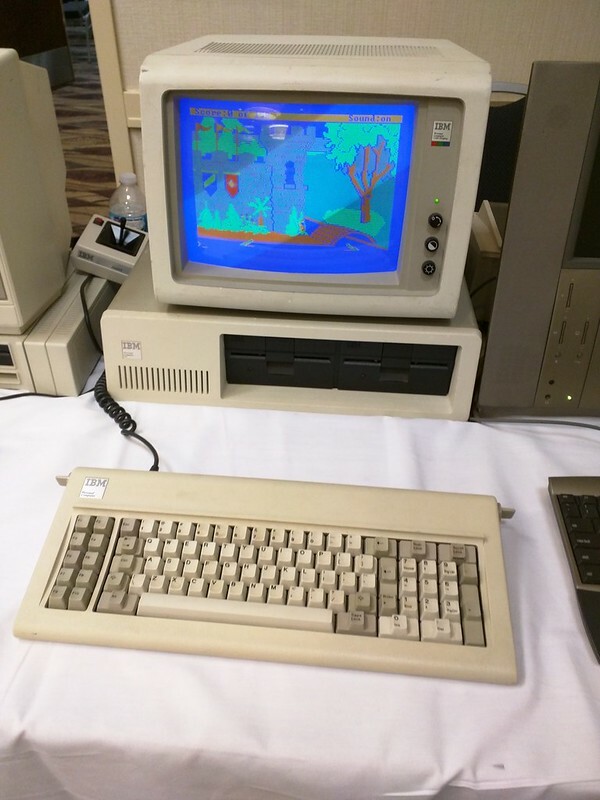 He was fascinated by the IBM PC XT, which I explained was just about like a model I used to get to use sometimes. They learned about floppy disks and how computers store information. He hadn’t used joysticks much, and found Pong (“this is a soccer game!”) interesting. 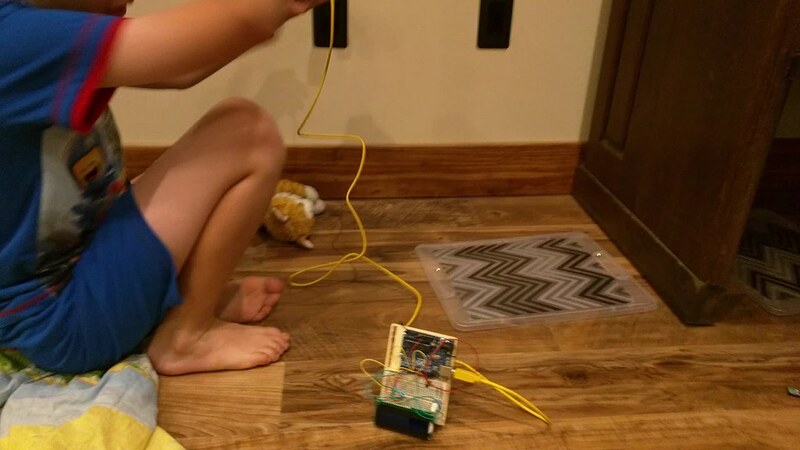 Somebody has also replaced the guts of a TRS-80 with a Raspberry Pi running a SNES emulator. This had thoroughly confused me for a little while, and excited Oliver. 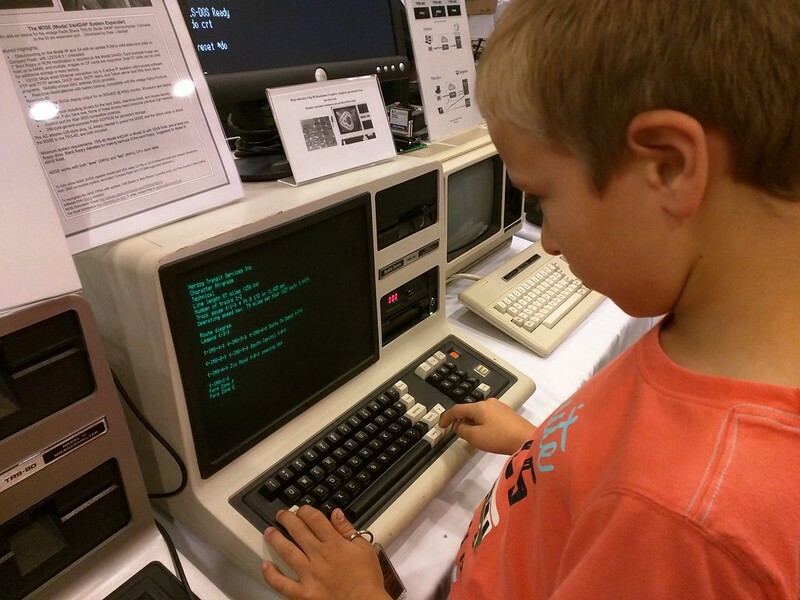 Jacob enjoyed an old TRS-80, which, through a modern Ethernet interface and a little computation help in AWS, provided an interface to Wikipedia. Jacob figured out the text-mode interface quickly. Here he is reading up on trains. 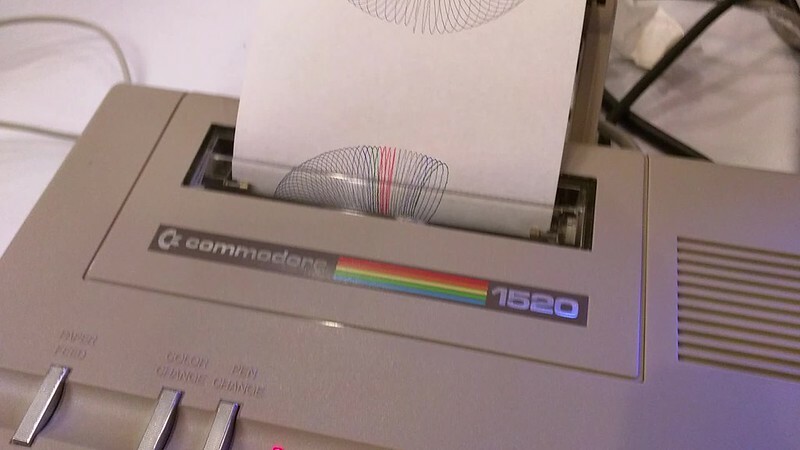 I had no idea that Commodore made a lot of adding machines and calculators before they got into the home computer business. 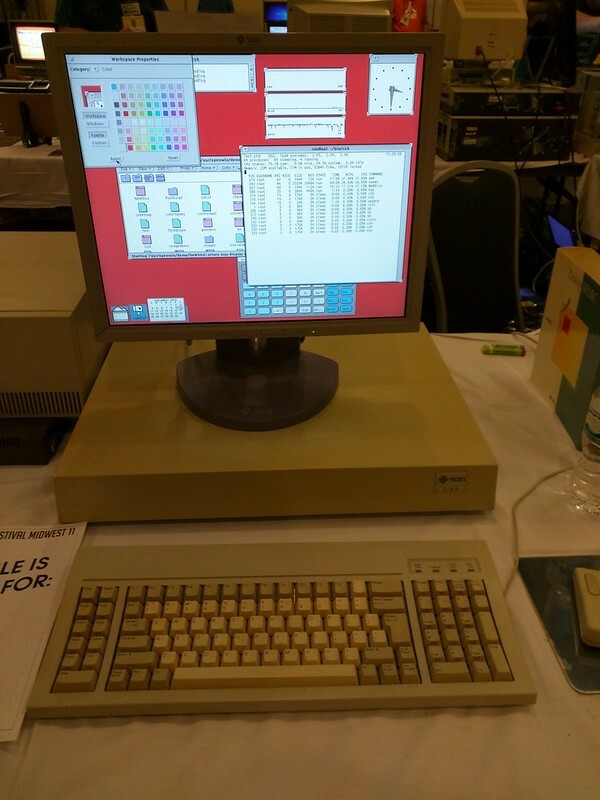 There was a vast table with that older Commodore hardware, too much to get on a single photo. But some of the adding machines had their covers off, so the boys got to see all the little gears and wheels and learn how an adding machine can do its printing. And then we get to my favorite: the big iron. 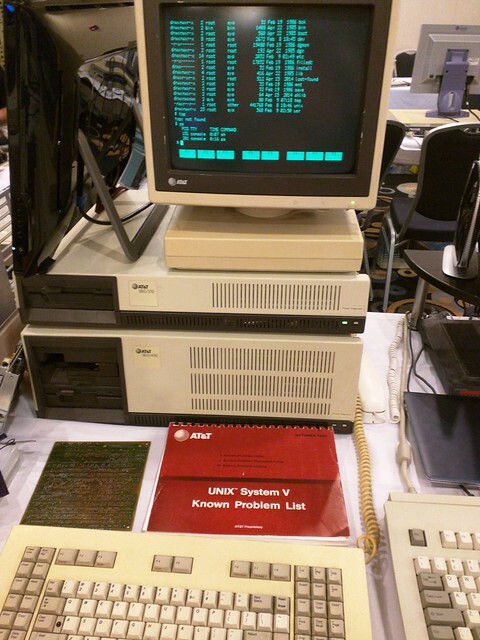 Here is a VAX — a working VAX. When you have a computer that huge, it’s easier for the kids to understand just what something is. When we encountered the table from the Glenside Color Computer Club, featuring the good old CoCo IIs like what I used as a kid (and have up in my attic), I pointed out to the boys that “we have a computer just like this that can do these things” — and they responded “wow!” I think they are eager to try out floppy disks and disk BASIC now. After all the excitement of the weekend, both boys zonked out for awhile on the flight back home. Here’s Jacob, sleeping with his maps still up. As we were nearly home, we hit a pocket of turbulence, the kind that feels as if the plane is dropping a bit (it’s perfectly normal and safe; you’ve probably felt that on commercial flights too). 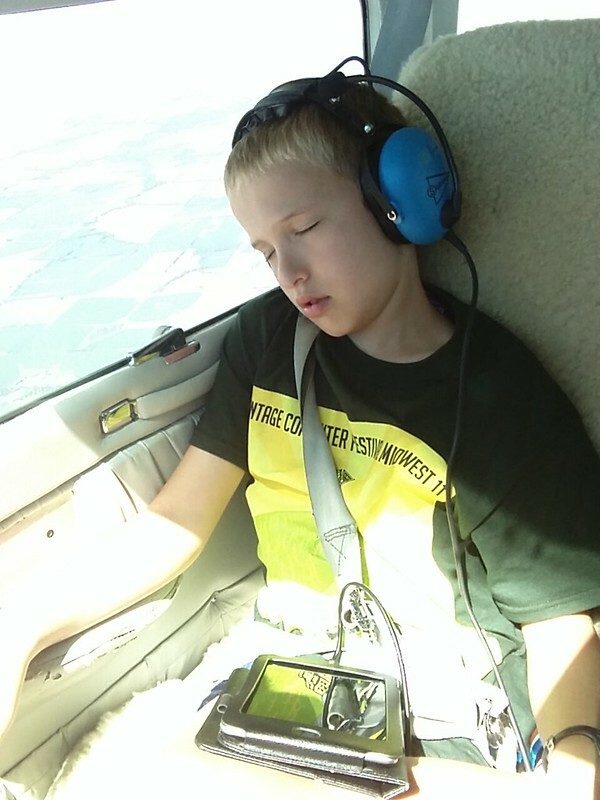 I was a bit concerned about Oliver; he is known to get motion sick in cars (and even planes sometimes). But what did I hear from Oliver? 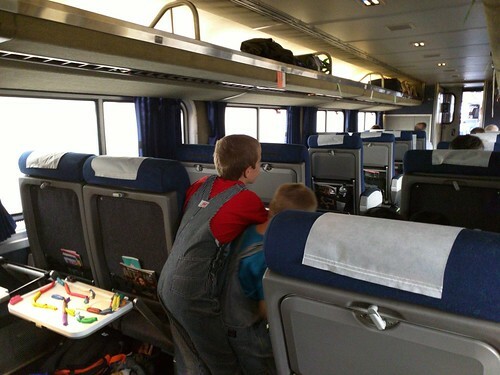 And so began a “trip” aboard our hotel train in Indianapolis, conducted by our very own Jacob and Oliver. 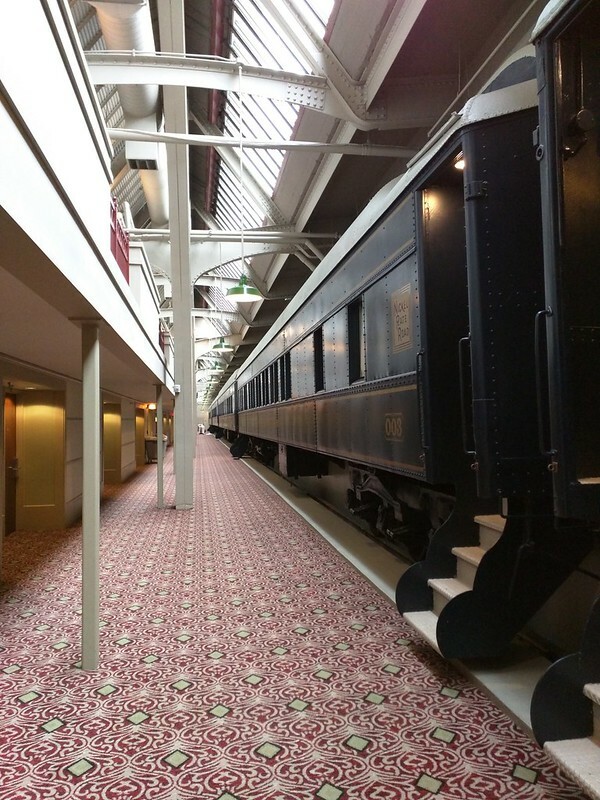 Because, well, what could be more fun than spending a few days in the world’s only real Pullman sleeping car, on its original service track, inside a hotel? 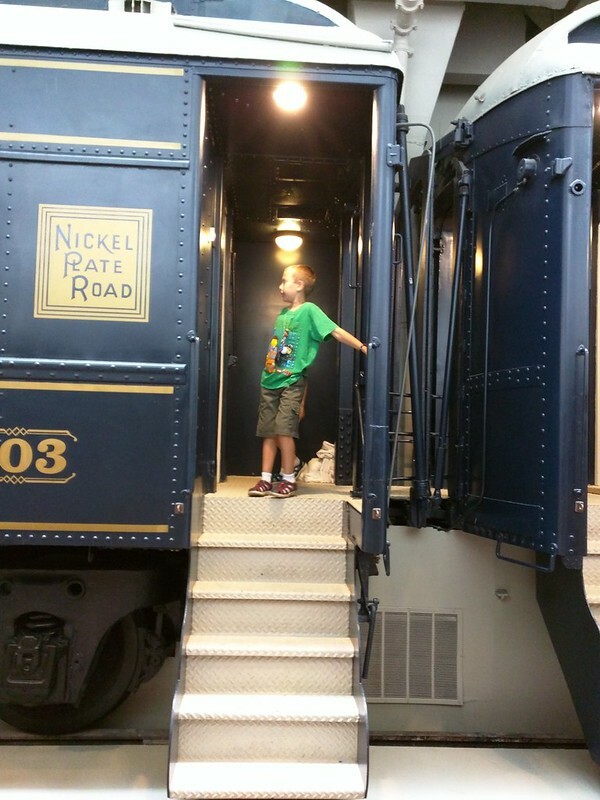 We were on a family vacation to Indianapolis, staying in what two railfan boys were sure to enjoy: a hotel actually built into part of the historic Indianapolis Union Station complex. This is the original train track and trainshed. They moved in the Pullman cars, then built the hotel around them. 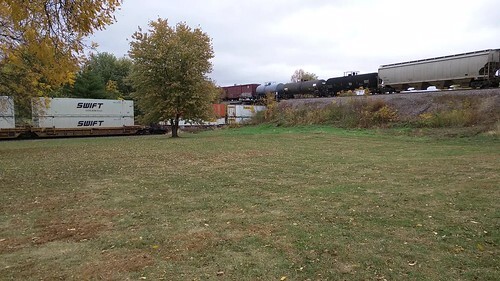 Jacob and Oliver played for hours, acting as conductors and engineers, sending their “train” all across the country to pick up and drop off passengers. Have you ever seen a kid’s face when you introduce them to something totally new, and they think it is really exciting, but a little scary too? And when it finally WAS our “opa”, there were laughs of delight and I suspect they thought that was the best cheese ever. Fun times were had pressing noses against the glass around the elevator. 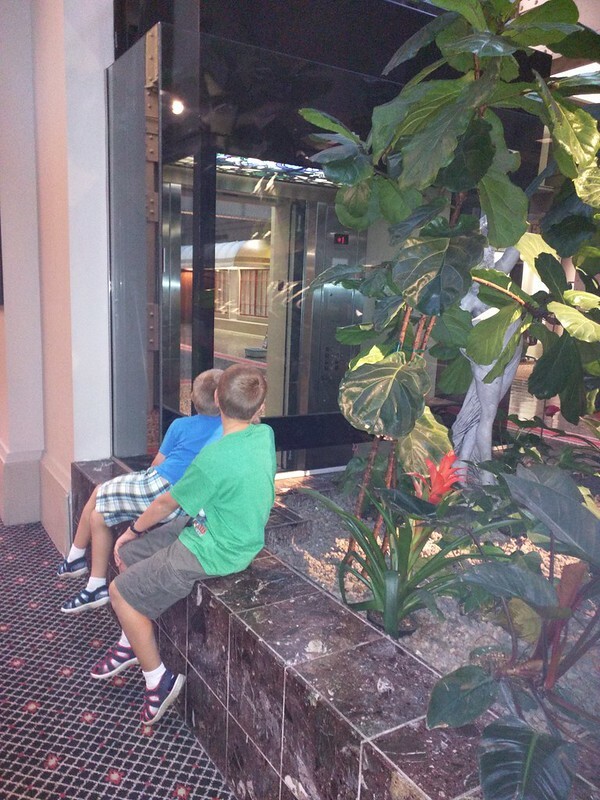 Laura and I sat on a nearby sofa while Jacob and Oliver sat by the elevators, anxiously waiting for someone to need to go up and down. They point and wave at elevators coming down, and when elevator passengers waved back, Oliver would burst out giggling and run over to Laura and me with excitement. 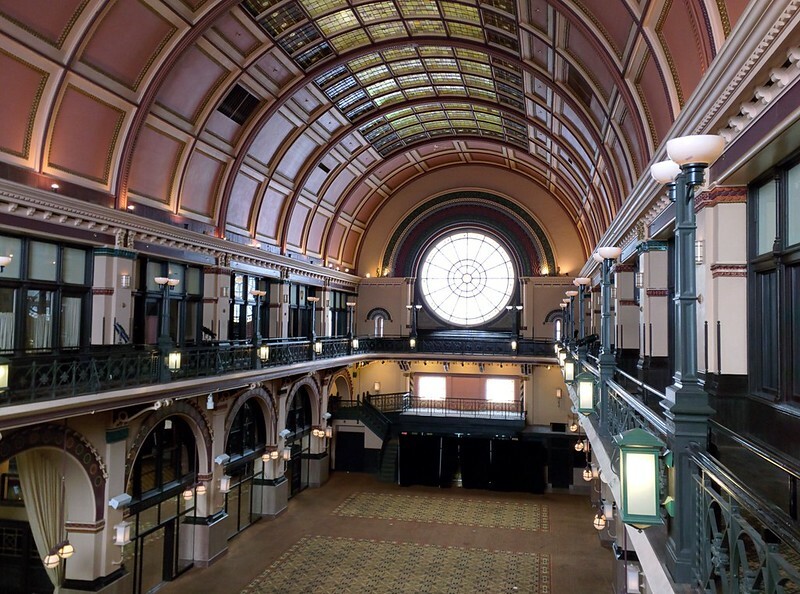 We got to see the grand hall of Indianapolis Union Station — what a treat to be able to set foot in this magnificent, historic space, the world’s oldest union station. 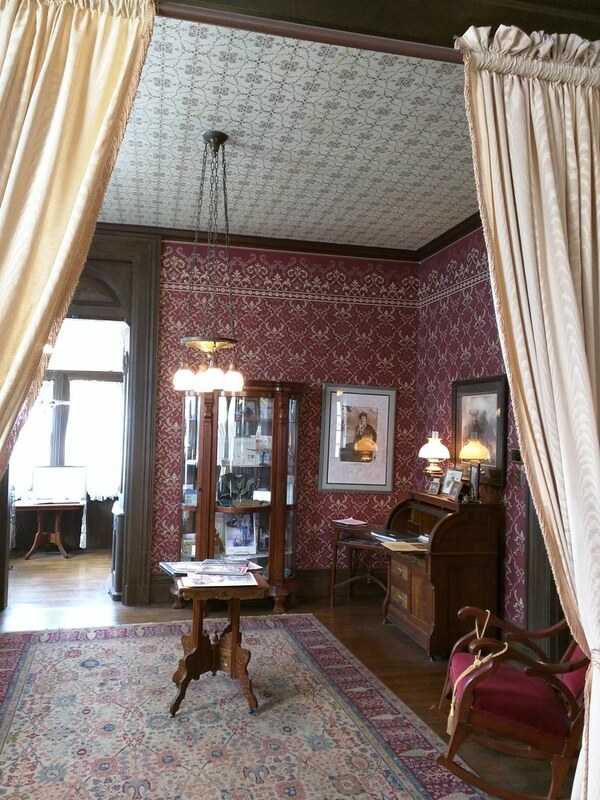 We even got to see the office where Thomas Edison worked, and as a hotel employee explained, was fired for doing too many experiments on the job. Indy has a system of elevated walkways spanning quite a section of downtown. 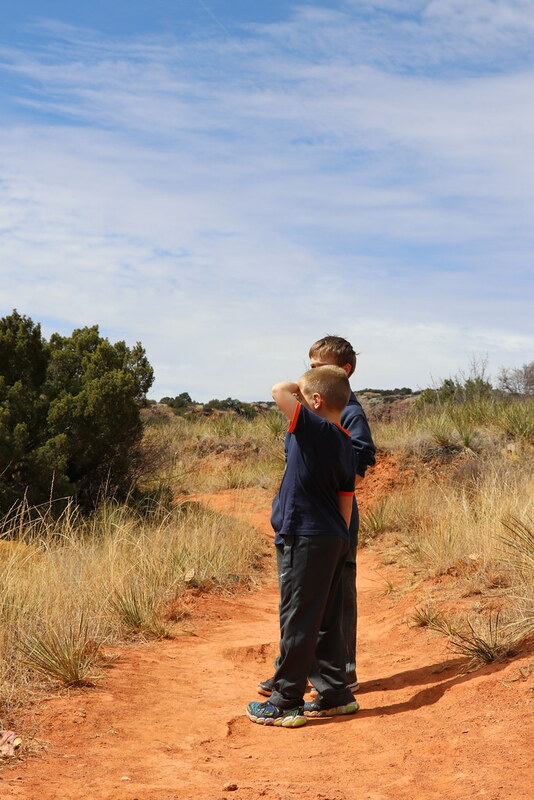 It can be rather complex navigating them, and after our first day there, I offered to let Jacob and Oliver be the leaders. Boy did they take pride in that! They stopped to carefully study maps and signs, and proudly announced “this way” or “turn here” – and were usually correct. 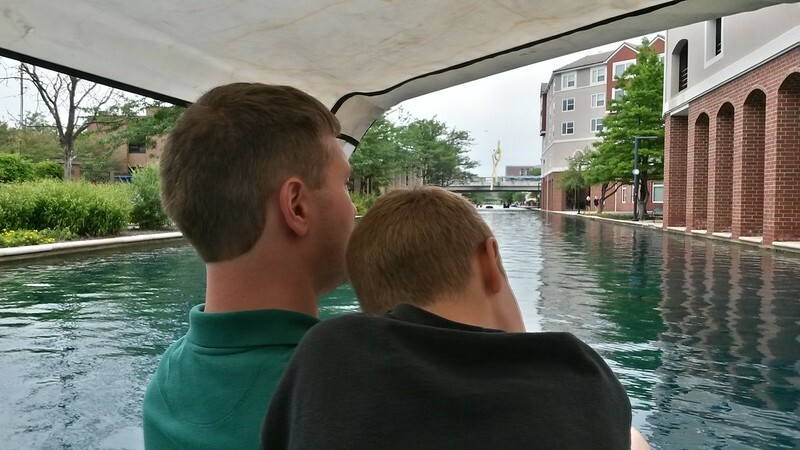 And it was the same in the paddleboat we took down the canal. Both boys wanted to be in charge of steering, and we only scared a few other paddleboaters. 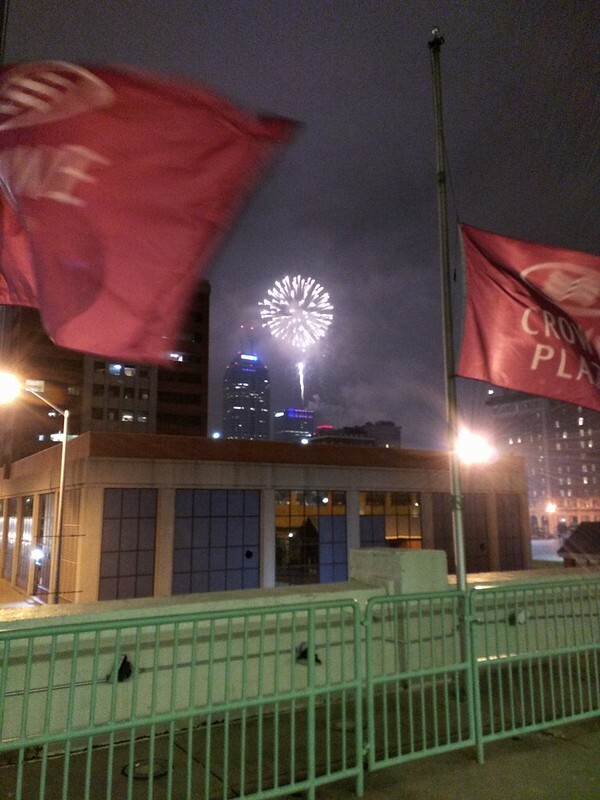 Our visit ended with the grand fireworks show downtown, set off from atop a skyscraper. I had been scouting for places to watch from, and figured that a bridge-walkway would be great. A couple other families had that thought too, and we all watched the 20-minute show in the drizzle. 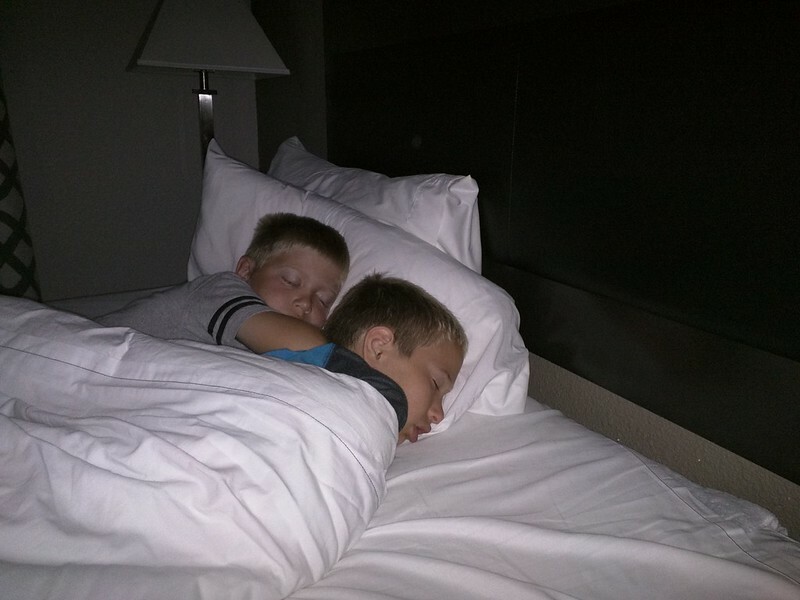 By far my favorite photo from the week is this one, of Jacob and Oliver asleep, snuggled up next to each other under the covers. They sure are loving and caring brothers, and had a great time playing together. The last few weeks have been pretty hectic in their way, but I’ve also had the chance to take some time off work to spend with family, which has been nice. For Memorial Day, I decided it would be nice to have a cookout for breakfast rather than for dinner. So we all went out to the fire ring. Jacob and Oliver helped gather kindling for the fire, while Laura chopped up some vegetables. Once we got a good fire going, I cooked some scrambled eggs in a cast iron skillet, mixed with meat and veggies. Mmm, that was tasty. Then we all just lingered outside. 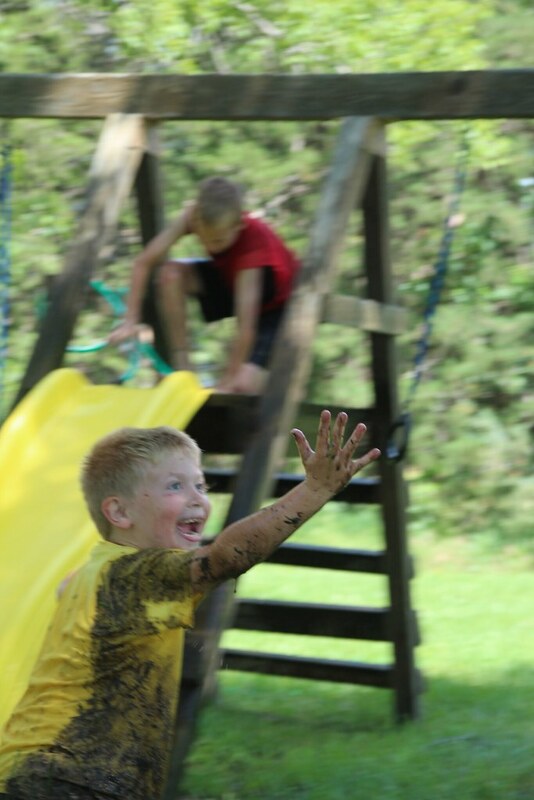 Jacob and Oliver enjoyed playing with the cats, and the swingset, and then…. water. 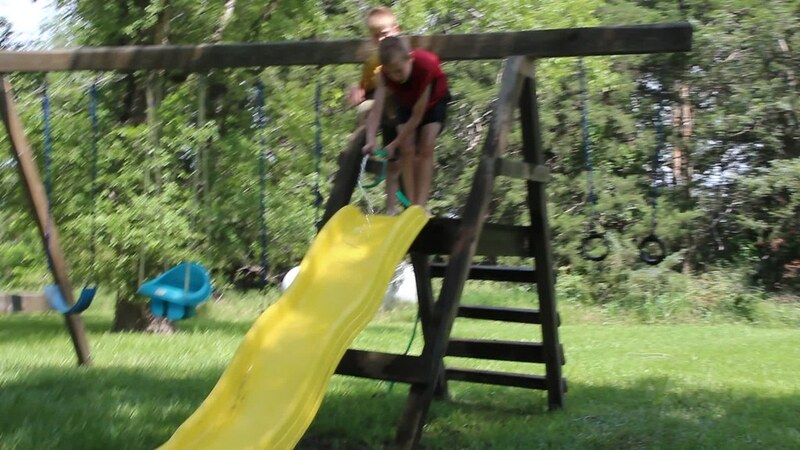 They put the hose over the slide and made a “water slide” (more mud slide maybe). Then we got out the water balloon fillers they had gotten recently, and they loved filling up water balloons. All in all, we all just enjoyed the outdoors for hours. Somehow, neither Laura nor I have ever really been to Arkansas. We figured it was about time. 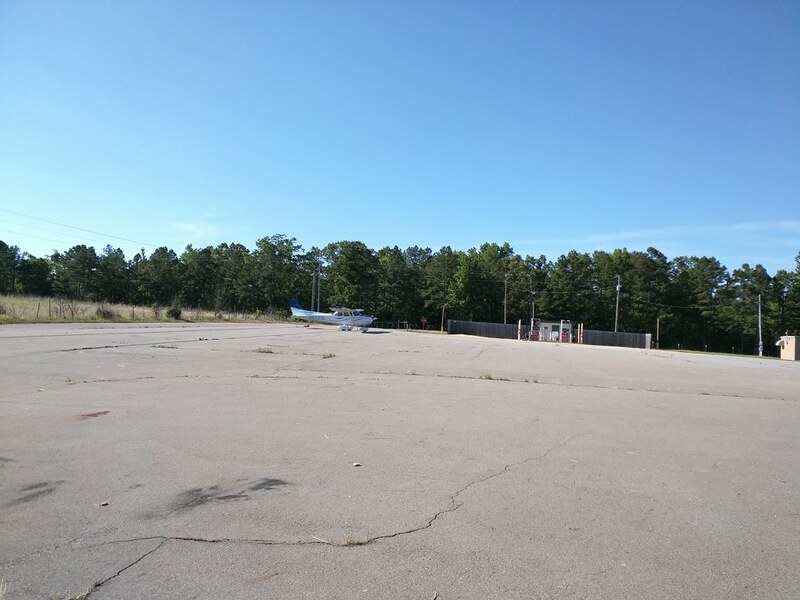 I had heard wonderful things about Petit Jean State Park from other pilots: it’s rather unique in that it has a small airport right in the park, a feature left over from when Winthrop Rockefeller owned much of the mountain. 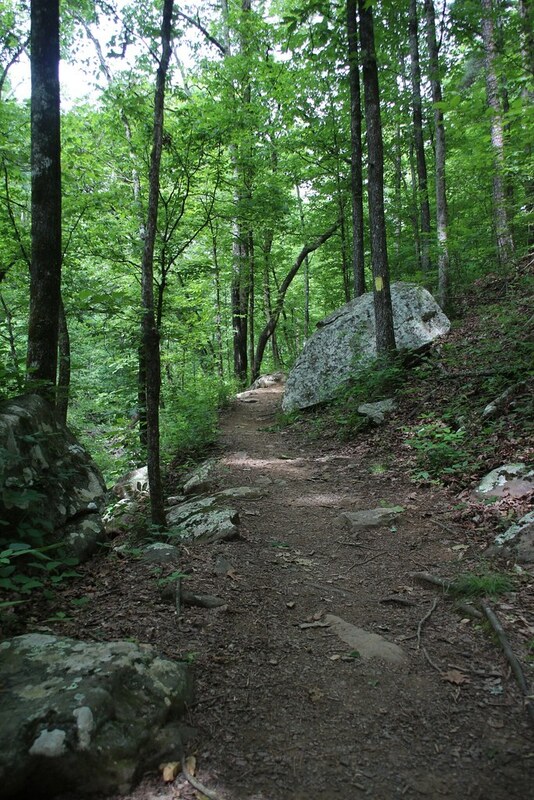 It was truly a relaxing, peaceful, re-invigorating place. 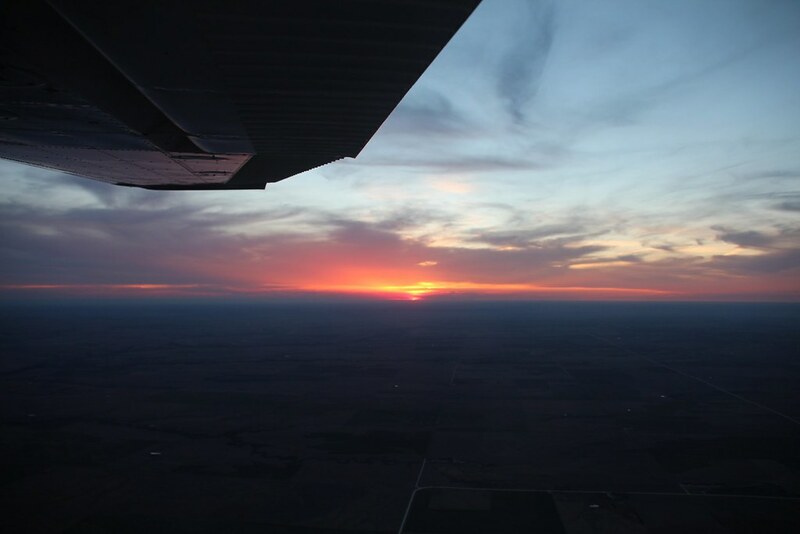 Last weekend, Laura and I decided to fly to Atchison, KS. Atchison is one of the oldest cities in Kansas, and has quite a bit of history to show off. 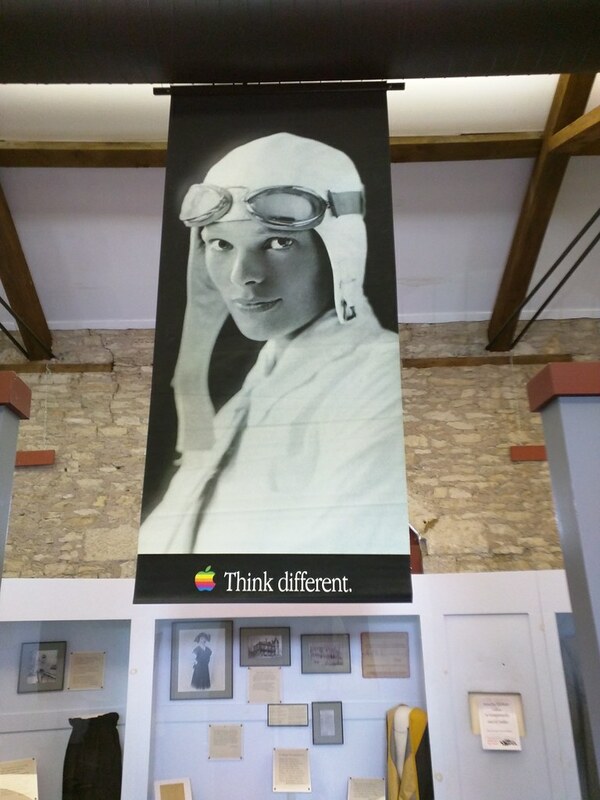 It was fun landing at the Amelia Earhart Memorial Airport in a little Cessna, and then going to three museums and finding lunch too. Of course, there is the Amelia Earhart Birthplace Museum, which is a beautifully-maintained old house along the banks of the Missouri River. “Will you have a car I can borrow?” I asked. 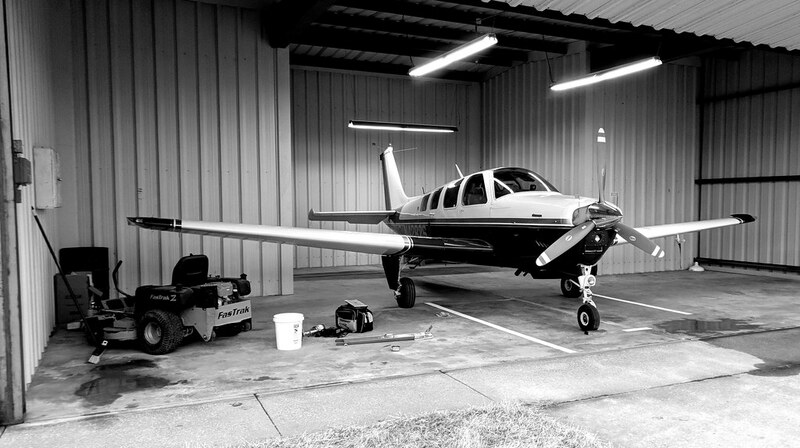 It is pretty common for small airports to have a car for a pilot to borrow when flying in. This lets a person go into town for lunch, or visit friends. And it’s usually free, with a can to donate a few bucks or a polite request to fill up the tank when you’re done. 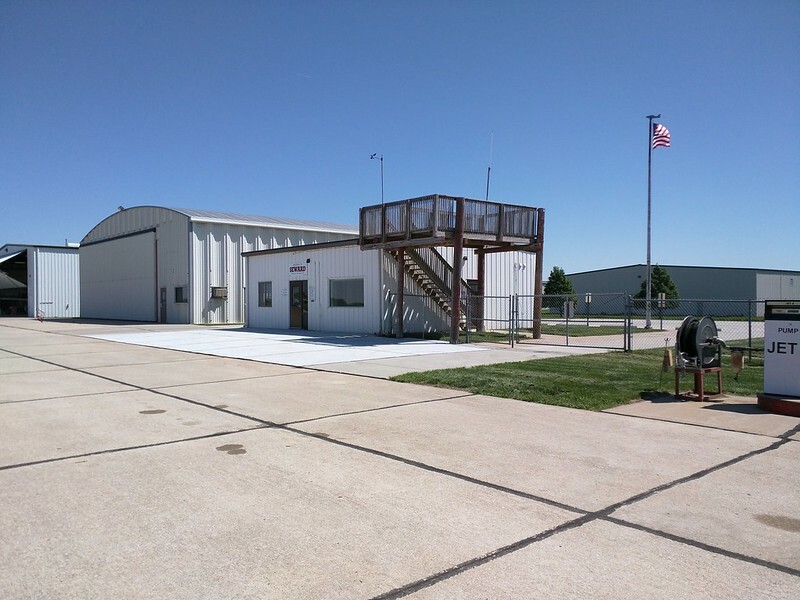 Still, when I had called ahead to ask about flying into the airport in a small town in north-central Kansas, I hadn’t expected to be told to just waltz into the place and take the key. But they had no staff at the airport most of the time. So, to me — another person from a small town — it made perfect sense. Somehow, because of that phone call, this town I had visited once, maybe 25 years ago, seemed instantly familiar. My mom grew up in a small town near there. She wanted me to see where she grew up, to meet some people that meant a lot to her. As it’s quite a distance from home, I offered to fly her there. So, Laura, mom, and I climbed into a Cessna one morning for the flight northwest. We touched down at the airport, and I pulled the plane up to the little terminal building. After I took care of parking the plane, I went to find the car. Except the car was missing. Some other pilot had flown in the same day and was using it, according to the logbook on the desk. I called the number on a sign — which rang to the sheriff’s office — and they confirmed it. According to the logbook, this was only the third time that car had been driven since Thanksgiving. Were we stuck at the airport a few miles out of down? Nope. Mom called the people we were going to meet, a wonderful couple in their upper 80s. They drove out to pick us up. I’m rather glad the car was gone, because I had such a great time visiting with them. Norris told me about the days when the state highways were gravel — how they’d have to re-blade them every few days due to all the traffic. I heard about what happened when the people in that community heard of some folks in Africa in need of car equipment — they modified a tractor to fit in a shipping container and shipped it to Africa, along with a lot of books, blankets, supplies, and anything else needed to fill up a huge shipping container. Sounds like something people around here would do. We drove around a couple of the small towns. The town my mom grew up in has seen better days. Its schools closed years ago, the old hotel whose owner gave her piano lessons is condemned, and many houses have been lost. But the town lives on. 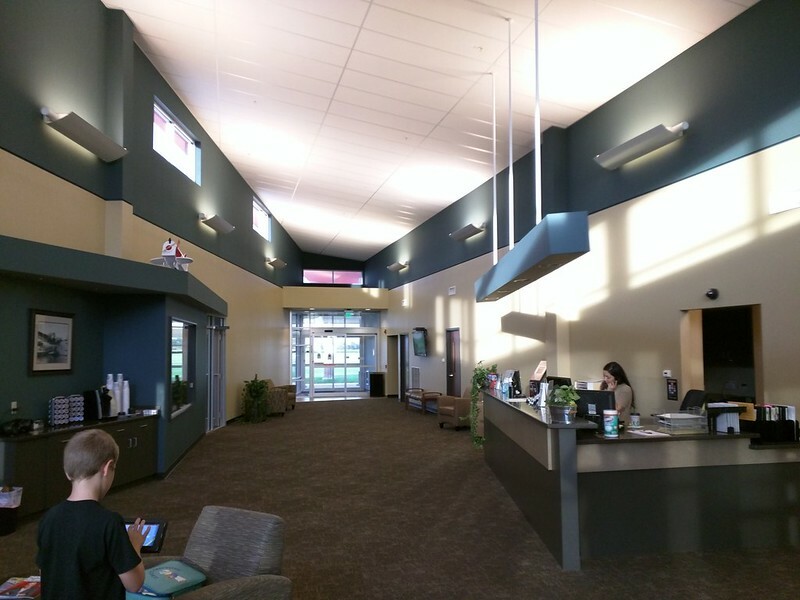 A new community center was built a few years ago. The grain elevator is expanding. Every time a business on Main Street closes, the grocery store expands a little bit: it’s now a grocery store with a little hardware store and a little restaurant mixed in. “The mall”, as the locals jokingly call it. And, of course, two beautiful small churches still meet every Sunday. 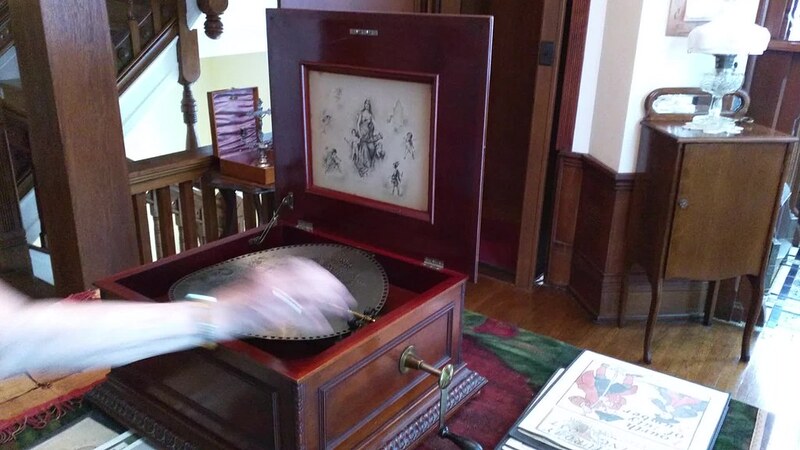 Here’s the one my mom attended as a child. We drove past the marker at the geographic center of the contiguous United States. Norris saw some other visitors, rolled down his windows, and treated them — and us — to an unexpected story of the time thousands of people banded together to completely build a house in a single day, just down the road. Smiles all around. So here I was, nearly 200 miles from home, in an unfamiliar town – but one where I could just feel the goodness. After spending a few hours with these people, I felt like they were old friends. As I flew us home, I spotted one of my favorite Kansas sights: a beautiful sunset. From the plane, it almost looks like the land at the horizon turns blue like the ocean, and above it the last hint of sun paints the canvas-sky. In this week of controversy, politics, and reports of violence, it reminds me that we all get the privilege of sharing this beautiful Earth. I didn’t ask anybody on that trip about their politics, religion, or opinions on any of the divisive issues of the day. Whether they agree with me on those things or not is irrelevant. I got to spend a day with good-hearted and delightful people, so I flew back with a smile. 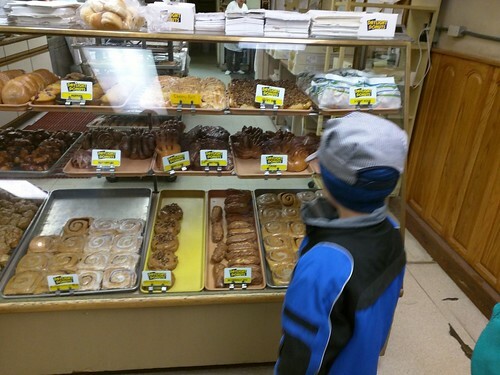 Sometimes, children are so excited you just can’t resist. 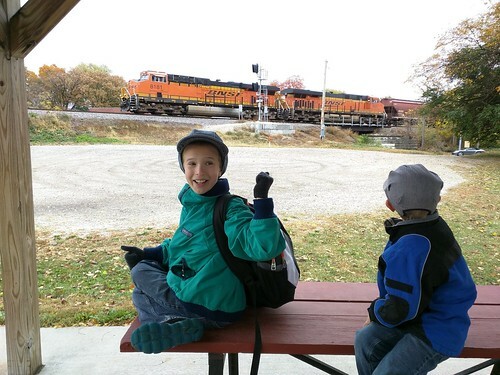 Jacob and Oliver have been begging for a train trip for awhile now, so Laura and I took advantage of a day off school to take them to the little town of Galesburg, IL for a couple days. Galesburg is a special memory for me; nearly 5 years ago, it was the first time Jacob and I took an Amtrak trip somewhere, just the two of us. And, separately, Laura’s first-ever train trip had been to Galesburg to visit friends. As the train was passing through here at around 4:45AM, and we left home with some time to spare, we did our usual train trip thing of stopping at the one place open at such a time: Druber’s Donuts. Much as Laura and I might have enjoyed some sleep once we got on the train, Jacob and Oliver weren’t having it. Way too much excitement was in the air. Jacob had his face pressed against the window much of the time, while Oliver was busy making “snake trains” from colored clay — complete with eyes. The boys were dressed up in their train hats and engineer overalls, and Jacob kept musing about what would happen if somebody got confused and thought that he was the real engineer. 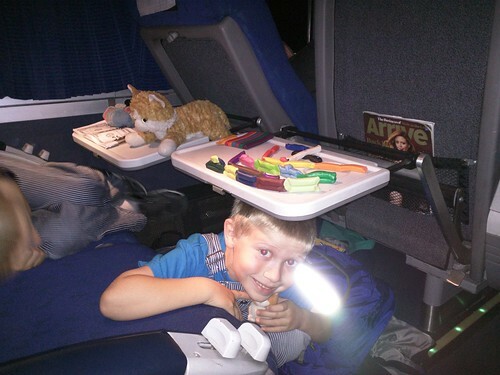 When an Amtrak employee played along with that later, he was quite thrilled! 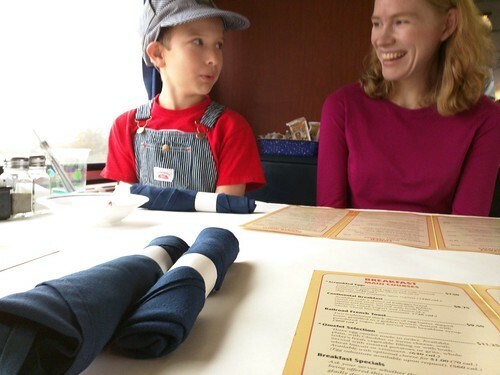 We were late enough into Galesburg that we ate lunch in the dining car. A second meal there — what fun! Here they are anxiously awaiting the announcement that the noon reservations could make their way to the dining car. Oh, and jockeying for position to see who would be first and get to do the all-important job of pushing the button to open the doors between train cars. Even waiting for your food can be fun. 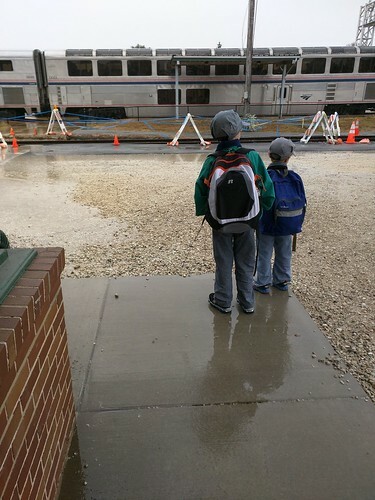 Upon arriving, we certainly couldn’t leave the train station until our train did, even though it was raining. Right next to the train station is the Discovery Depot Children’s Museum. It was a perfect way to spend a few hours. 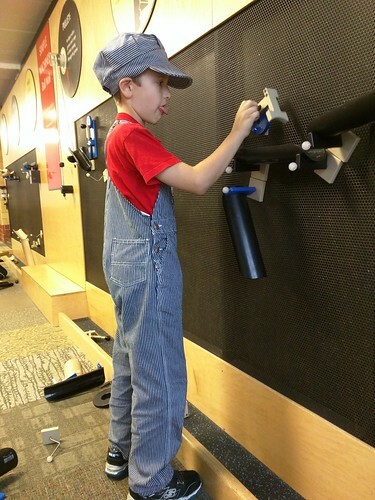 Jacob really enjoyed the building wall, where you can assemble systems that use gravity (really a kinetic/potential energy experiment wall) to funnel rubber balls all over the place. He sticks out his tongue when he’s really thinking. Fun to watch. 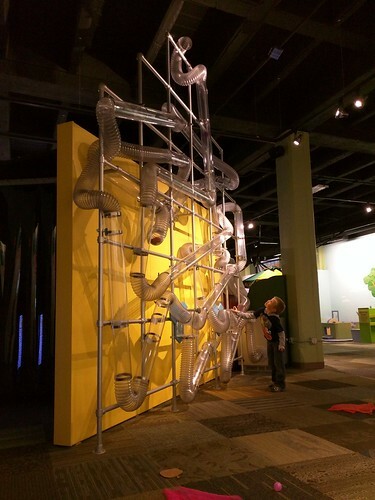 Meanwhile, Oliver had a great time with the air-powered tube system, complete with several valves that can launch things through a complicated maze of transparent tubes. They both enjoyed pretending I was injured and giving me rides in the ambulance. I was diagnosed with all sorts of maladies — a broken leg, broken nose. One time Jacob held up the pretend stethoscope to me, and I said “ribbit.” He said, “Dad, you’ve got a bad case of frog! You will be in the hospital 190 days!” Later I would make up things like “I think my gezotnix is all froibled” and I was ordered to never leave the ambulance again. He told the story of this several times. After the museum closed, we ate supper. Keep in mind the boys had been up since the middle of the night without sleeping and were still doing quite well! They did start to look a bit drowsy — I thought Oliver was about to fall asleep, but then their food came. And at the hotel, they were perfectly happy to invent games involving jumping off the bed. Saturday, we rode over to Peck Park. We had heard about this park from members of our church in Kansas, but oddly even the taxi drivers hadn’t ever heard of it. It’s well known as a good place to watch trains, as it has two active lines that cross each other at a rail bridge. And sure enough, in only a little while, we took in several trains. The rest of that morning, we explored Galesburg. We visited an antique mall and museum, saw the square downtown, and checked out a few of the shops — my favorite was the Stray Cat, featuring sort of a storefront version of Etsy with people selling art from recycled objects. But that wasn’t really the boys’ thing, so we drifted out of there on our way to lunch at Baked, where we had some delicious deep-dish pizza. After that, we still had some time to kill before getting back on the train. We discussed our options. 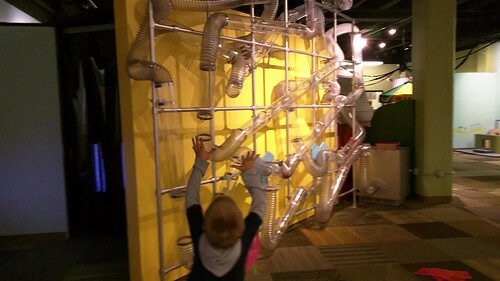 And what do you know — we ended up back at the children’s museum. We stopped at a bakery to get the fixins for a light supper on the train, and ate a nice meal in the dining car once we got on. Then, this time, they actually slept. Before long, it was 3AM again and time to get back off the train. Oliver was zonked out sleepy. Somehow I managed to get his coat and backpack on him despite him being totally limp, and carried him downstairs to get off the train. Pretty soon we walked to our car and drove home. We tucked them in, and then finally tucked ourselves in. Sometimes being really tired is well worth it. The sound of a steam locomotive whistle from down below, sounding loud all the way up there, then echoing back and forth through the valley. Then the quieter, seemingly more distant sound of the steam engine heading across the valley, chugging and clacking as it goes. More whistles, the sight of smoke and then of the train full of people, looking like a beautiful model train from our vantage point. I’ve heard that sound on a few rare recordings, but never experienced it. I’ve been on steam trains a few times, but never spent time in a town where they still run all day, every day. 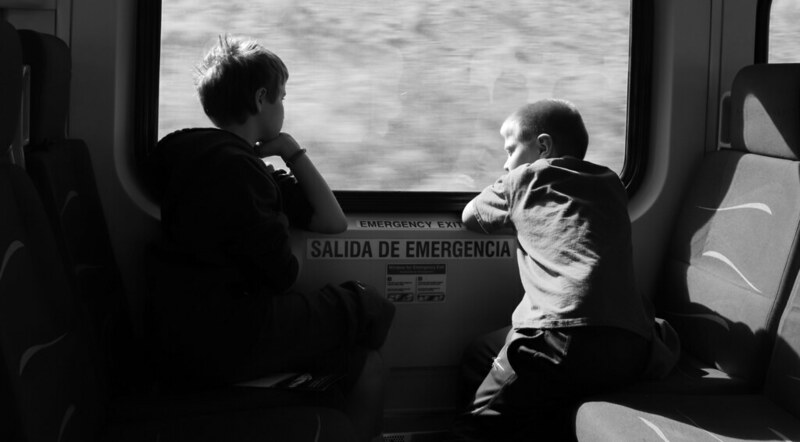 It is a different sort of feeling to spend a week in a place where Jacob and Oliver would jump up several times a day and rush to the nearest window in an attempt to catch sight of the train. Airplanes really can be a time machine in a sense — what a wondrous time to be alive, when things so ancient are within the reach of so many. I have been transported to Lübeck and felt the uneven 700-year-old stones of the Marienkirche underneath my feet, feeling a connection to the people that walked those floors for centuries. I felt the same in Prague, in St. George’s Basilica, built in 1142, and at the Acropolis of Lindos, with its ancient Greek temple ruins. In Kansas, I feel that when in the middle of the Flint Hills — rolling green hills underneath the pure blue sky with billowing white clouds, the sounds of crickets, frogs, and cicadas in my ears; the sights and sounds are pretty much as they’ve been for tens of thousands of years. 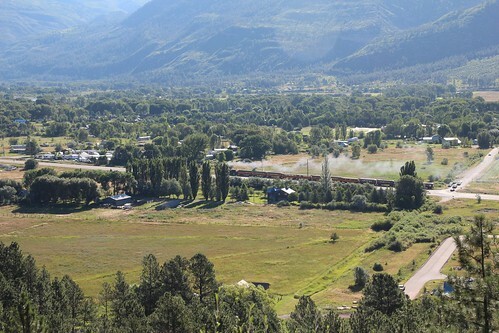 And, of course, in Durango, arriving on a plane but seeing the steam train a few minutes later. It was fitting that we were in Durango with Laura’s parents to celebrate their 50th anniversary. 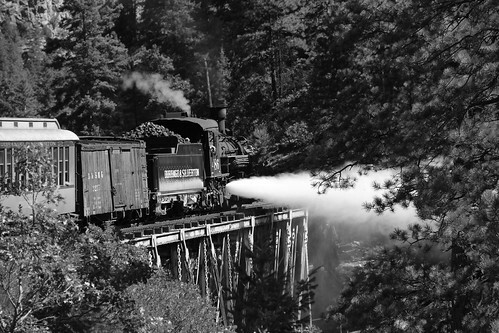 As we looked forward to riding the train, we heard their stories of visits to Durango years ago, of their memories of days when steam trains were common. We enjoyed thinking about what our lives would be like should we live long enough to celebrate 50 years of marriage. 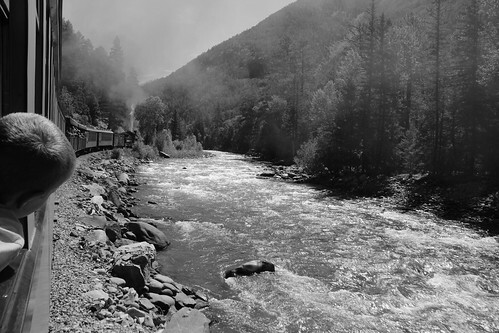 Perhaps we would still be in good enough health to be able to ride a steam train in Durango, telling about that time when we rode the train, which by then will have been pretty much the same for 183 years. Or perhaps we would take them to our creek, enjoying a meal at the campfire like I’ve done since I was a child. Each time has its unique character. I am grateful for the cameras and airplanes and air conditioning we have today. But I am also thankful for those things that connect us with each other trough time, those rocks that are the same every year, those places that remind us how close we really are to those that came before. Suggestions for visiting the UK? My wife and I have been thinking of visiting the UK for awhile, and we’re finally starting to make some plans. I would be grateful to anyone reading this that might have some time to make suggestions on places to go, things to do, etc. Here’s a bit of background, if it helps. I particularly enjoy old buildings: churches, castles, cathedrals. A 400-year-old country church off a dusty road would be as interesting to me as Westminster Abbey — I’d consider both awesome to see. Castles that are in a good state of repair would also be great. I’d enjoy getting in the countryside as well. My wife would enjoy literary connections: anything related to Dickens, A. A. Milne, Jane Austen, C. S. Lewis, etc. Although I know London is full of amazing sights, and that is certainly one destination we’re considering, I am also fine with things like Roman ruines in Wales, A. A. Milne’s estate, country churches, sites in Scotland, etc. Ireland / Northern Ireland might be a possibility, but we are mainly focused on Great Britain so far. Would we be able to accomplish this without a car? I understand it is rather difficult for Americans to have to drive in the UK. Are there non-conventional lodging options such as bed and breakfasts that might let us get to know our hosts a little better? If it helps understand me better, some highlights from my past trips included the amazing feeling of stepping back in time at Marienkirche in Lübeck or the Museum in der Runden Ecke (a former Stasi building in Leipzig), exploring the old city of Rhodes, or becoming friends with a shop owner in Greece and attending an amateur radio club meeting with him. Finally, we would probably not be able to go until September. Is that a reasonable time? Is part of September maybe less busy but still decent weather?